You are here: Home / Crochet Other / Affiliate Posts / Create Your Own Cookbook with Blurb! Create Your Own Cookbook with Blurb! This is a sponsored post. All links in this post are affiliate links and I will be compensated if you make a purchase after clicking on my links. I thank you for helping to support the costs associated with operating Oombawka Design. Please read my disclosure policy for more information. Ever thought of putting your favourite recipes into a beautiful book you can give as a gift, or you can pass down to future generations? Blurb is a company that lets anyone create beautiful books from their favourite content and you can get those books shipped in any quantity (even just one copy). Not a designer? No need to worry! Use Blurb’s free BookSmart software to create a great cookbook, easily! 1. Organize: Review your recipes and narrow your collection down to your favourites. Select the best images available to showcase your favourite recipes and remember to use the same file name for both the recipe and image(s) you save (this will make it easier when it’s time to upload you selections to Blurb). Create and save all your files for this project in one folder on your computer. 2. Flow it: Decide how you would like your cookbook to be organized. Do you want to present your recipes by age, popularity, or category (i.e. appetizers, desserts, etc.)? Once you have decided how you would like to categorize your recipes, the bulk of your creative decision-making is complete! 3. Get the tool: Download Blurb’s free book-making tool, BookSmart. Select the book size you prefer, (Standard Portrait/Standard Landscape are the most popular choices for cookbooks) enter your Cookbook Title and Author’s name. Next, choose “Cookbook” as your starting point — this will show you the best available layouts for your project. Once you have selected your layout, choose the source where your images are stored— from iPhoto, your computer, Flickr, or Picasa. Finally, choose a theme. You are now ready to put together your cookbook! 4. 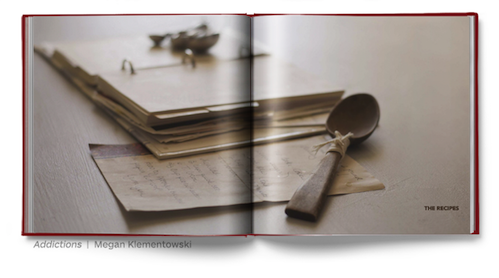 Lay it out: BookSmart will provide you with 20-pages in the standard recipe layout. To find alternate layout options, select “Choose page layout” from the panel on the upper left side of the screen. You can also add additional pages ­­— including photo pages — by clicking “Add Pages” in the top toolbar. 5. Just add copy: The layouts provide space for stories, introductions, ingredients and directions. Paste in your copy and garnish with photos. Remember to run BookSmart’s spell check feature. 6. Preview and review: Click “Review book” and go through your book, page by page. If you are not a natural-born proofreader, ask a friend to take a look. That’s it, you’re done! Bon Appétit!